PITTSBURGH -- A brief tussle between Pittsburgh Steelers left guard Ramon Foster and linebacker Shayon Green briefly interrupted the team's organized team activities (OTAs) on Thursday. "Aw, nothing," Foster said of the incident, "just tempers fly, tempers fly, small things that happen in this time of year. No, we shook on it, everything's all good." The 6-foot-6, 325-pound Foster, 29, is a seventh-year veteran who's started for the past four seasons. He was an undrafted rookie free agent out of Tennessee in 2009. Green stands at 6 feet, 3 inches and 262 pounds. The former Miami linebacker did not play last season after going undrafted in the 2014 NFL Draft. The Steelers signed him on April 2 of this year. After the fight, the two players slapped hands. Said Foster: "That's all you do." The conflict happened after the portion of practice when cameras are allowed, so you're not likely to see any of it. The Pittsburgh Steelers announced earlier today that they added linebacker Shayon Green to their offseason roster. Green was a defensive end as well as a linebacker in college for Miami. The former Hurricane originally went undrafted last year. He had a verbal agreement to sign as a free agent with the Miami Dolphins, but never actually signed. The Dolphins later worked him out in November as well. Green worked out at Miami’s Pro Day yesterday before signing with the Steelers, who were represented at the event. Collegiately, Green had to overcome multiple ACL tears during his playing career. In his final season for the Hurricanes in 2013, he started all 13 games, recording 68 tackles, including 10.5 for loss, to go along with three sacks. He also earned multiple awards for leadership. Presumably brought in to play outside linebacker, Green joins a cast of minor characters hoping to vie for a spot on the 53-man roster, behind the three roster locks in Jarvis Jones, Arthur Moats, and James Harrison. Last year’s undrafted free agent, Howard Jones, spent all of the past season with the Steelers on the practice squad. The team also signed CFL standout Shawn Lemon earlier this offseason. Between the three of them, they may all be competing for one job on the practice squad when all is said and done. In front of reps from all 32 NFL teams, the unquestioned star was receiver Phillip Dorsett. He blazed his way to an unofficial 4.25-second 40-yard dash after running an already-excellent 4.33 at the NFL combine in February. He could have settled on that time and simply performed pass-catching drills for NFL scouts, but Dorsett wanted to put on a show. Dorsett, who measured in at 5-foot-10 and 184 pounds, said he improved his vertical to 38 inches (he leaped 37 at the combine) and bench-pressed 225 pounds 13 times (he did not lift at the combine). Dorsett will work out for the Dolphins, Panthers and Falcons. What if the hometown chose him? “Being a Hurricane and I always was a fan of the Dolphins, too,” said Dorsett, from Fort Lauderdale-St. Thomas Aquinas. “It would be great. It would be a dream come true,” he said. * Linebacker Denzel Perryman suffered a pulled right hamstring and scratched on his second attempt at running the 40-yard dash. UM did not release official testing results to the media, but according to a group of scouts that got together and compared times, Perryman’s first heat in the 40 was a 4.67 — better than the 4.78 he ran in Indianapolis. He said he measured in at 5-11 and 239 pounds and put up 30 reps of 225 pounds. He increased his vertical from 32 (combine) to 33 inches. Perryman watched film with the Lions hours before pro day began and has three NFL team visits lined up: he will meet with the Dolphins next Thursday, the Falcons on April 12 and the Panthers on April 16. Along with Clive Walford and Dorsett, he ate dinner with Saints brass Tuesday night at Fleming’s Steakhouse in Coral Gables. Perryman said he ate shrimp and scallops (Rob Ryan had a steak, if you were wondering). * Running back Duke Johnson ran a 4.47 twice, which was a much better result than his combine time (4.54). He also “caught the ball naturally,” according to Mayock. Dolphins GM Dennis Hickey agreed. Johnson, who measured in at 5-9 and 203 pounds, said he did 18 reps of 225. He did not lift at the NFL combine. Tight end Clive Walford did not run because he suffered a hamstring pull last week. Walford (6-4, 250) said he would meet with the Steelers after pro day and the Falcons and Packers in the coming days. He said he has talked to a laundry list of teams, including the Dolphins, Saints, Falcons, Packers, Broncos, Chargers, 49ers, Ravens, Chiefs and Buccaneers. Walford, a Glades Central grad and South Bay native, on the hometown team: “I talked to them. I wouldn’t say a lot, but I saw that move that they made this offseason. Shout-out to the Dolphins.” He’s talking, of course, about the Fins adding Ndamukong Suh. 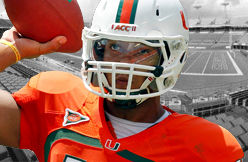 Is UM’s tight end tradition helping his draft stock? “We produce great tight ends,” he said. “Look at the history. We’ve got great ones to come. I feel I kept up that legacy. Hopefully the young ones do as well. 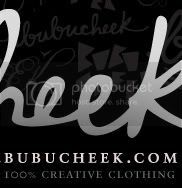 * Offensive tackle Ereck Flowers, a projected first-rounder, did not perform lifting drills – he was the top overall bench-presser at the NFL combine, with 37 reps of 225 – but did everything else. Flowers did not speak to the media (he rarely does). Mayock was very high on Flowers, Jon Feliciano and Shane McDermott‘s performances. * Quarterbacks Ryan Williams and Jake Heaps threw a variety of routes for scouts. Williams said he checked in at 6-4 and change and 215 pounds, and ran a 4.84 in the 40. Before tearing his ACL last April 4 – 362 days ago – he said he ran in the 5-second range. He definitely looked a lot faster than before. He has several meetings scheduled, but has not worked out with an NFL team. * Cornerback Ladarius Gunter ran a solid 4.56 time in the 40 and looked very rangy in coverage drills. He’s projected as a mid-round pick. * Linebacker Thurston Armbrister showed good speed and agility, though he struggled to catch interceptions in drills. Would bet he gets a shot somewhere. * Defensive tackle Olsen Pierre ran a 5.15 in the 40. * If you saw my Twitter feed, you’ll get a roll of NFL personnel I spotted, but among the notables were a large contingent of Dolphins personnel (GM Dennis Hickey, VP Mike Tannenbaum, head coach Joe Philbin, offensive coordinator Bill Lazor, defensive coordinator Kevin Coyle, running backs coach Jeff Nixon, special teams coordinator Darren Rizzi), Jets head coach Todd Bowles, Saints head coach Sean Payton and defensive coordinator Rob Ryan and Steelers head coach Mike Tomlin. NFL Network said seven GMs attended, including Hickey. The others: Mickey Loomis (Saints), Mike Maccagnan (Jets), Kevin Colbert (Steelers), Doug Whaley (Bills), Steve Keim (Arizona), Ruston Webster (Tennessee) and Floyd Reese (Giants). Former Dolphins GM Jeff Ireland, now a college scout with New Orleans, was also there. 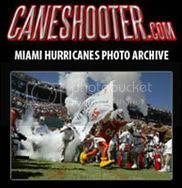 * Former Hurricanes who attended included Andre Johnson, Frank Gore, Clinton Portis, Edgerrin James, Demarcus Van Dyke, Jacory Harris, Lamar Miller and Tommy Streeter. A slew of players from the 2012 and 2013 teams were there. Jonathan Vilma was also in attendance, working for NBC Sports along with former Dolphins great Jason Taylor. NFL Network had a five-person crew and analyst Mike Mayock interviewed several UM players and coach Al Golden, who did not speak to other media. * Former Hurricanes running back Damien Berry, a Glades Central grad who won a Super Bowl with Baltimore in 2012, was the oldest of several pre-2014 Hurricanes who worked out (linebacker Tyrone Cornelius and defensive end Shayon Green, both from the 2013 team, also performed). “I’m still young, 26 years old. I think it’s time to give it another shot,” said Berry, who last played for UM in 2010 and now lives in Boca Raton. Berry, 5-11 and 230 pounds, he said he ran a 4.7 in the 40. David Gilbert and Luther Robinson – signed NFL contracts Monday. Gilbert signed a contract with the Tennessee Titans where he will play outside linebacker, which is moving to a “hybrid” 3-4 defense. Gilbert had tried out for the Titans last week, as did AJ Highsmith who was not signed. Luther Robinson signed a rookie deal with the Green Bay Packers, where he is listed as a defensive end. Here is the full list of NFL proCane Rookies and where they have signed. 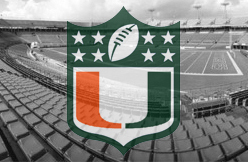 Three NFL proCanes were drafted this past weekend during the NFL Draft, while 11 other proCanes signed Free Agent Contracts. 3rd Round, 93rd pick overall: Brandon Linder, Jacksonville Jaguars.